This Fisherman & Dory Weather Vane shows a lovely mix of metals. The dory and the rower’s rain gear are copper. The oar blades and rower’s face and hands are of brass. 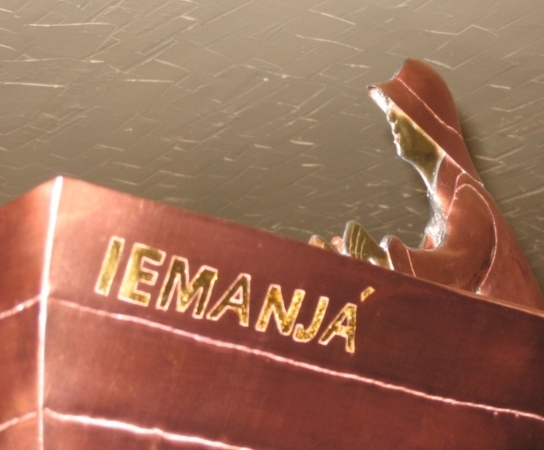 The boat’s name is in gold leaf, and is included in the price of the weathervane. Because our vanes are made to order, each customer selects the metals at the time their order is placed. 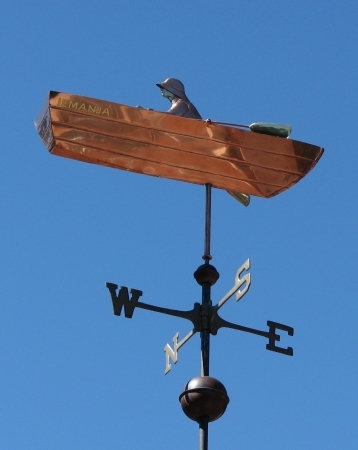 You will notice that in our version of this weathervane design, we have made the entire fisherman’s body even though it is not necessarily visible from the ground. We reason we do this is because while the weathervane maybe spend 50 or 60 years atop a structure, at some point in the future, someone may bring it down off the roof and display it indoors as a classic example of a traditional American Folk Art. At that point, these details would certainly be visible and add to the desirability of the weathervane. In the photo you will see that some ‘lucky’ pennies were added to this weathervane. This is based on a tradition that dates back to the Victorian Age. 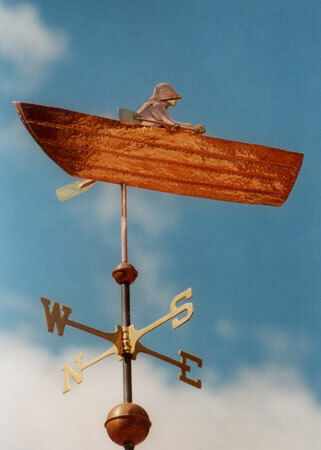 Since we make weathervanes to order, in addition to a penny from the year the weathervane was made, our customers can request pennies from years special to them. We will then include them with their weathervane. Many of our customers request pennies from the years of family member’s births, although pennies signifying special occasions such as birthdays, anniversaries and even retirements are also popular. For centuries, dories have been used as traditional fishing boats, both in coastal waters and in the open sea. Simeon Lowell of Amesbury Massachusetts is credited with building the first dories around 1793, which he referred to as ‘wherries’. Dories were built all over New England from the Long Island Sound to the shores of Nova Scotia, with major production centers north of Boston to the New Hampshire border. Variant spellings are doree and dori. Despite their simplicity, dories were known for their seaworthiness and rowing ease, although this reputation possibly owed more to the skill of the operators than inherent factors in the design.